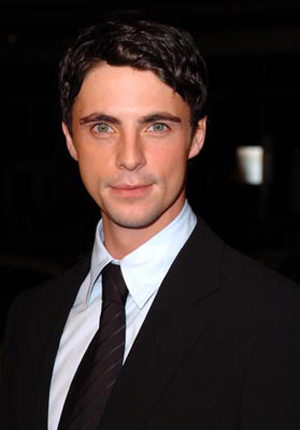 Matthew Goode has been busy since starring as Ozymandias in Zack Snyder’s Watchmen. The 31 year old actor starred in A Single Man with Colin Firth that is loved by the critics, he’s about to be seen with Amy Adams in the romantic comedy Leap Year and he is also in Ricky Gervais’ Cemetery Junction. It also turns out that he recently auditioned for the role of Bilbo Baggins in Guillermo del Toro’s adaption of The Hobbit. Something which the 6ft 2 actor found quite funny when speaking to The Telegraph. Now he’s a father, Goode doesn’t even like travelling that much. But just before we met, he’d auditioned for the role of Bilbo Baggins in Guillermo del Toro’s two-part film of The Hobbit. As he is the first to admit, he’s not an obvious choice – ‘Look at the size of me for Christ’s sake!’ If he got the part, he would, he says, find it almost impossible to refuse – despite the fact that it would involve him spending several months in New Zealand. No word on how he got on at the audition or who else has been looked at. Still wondering when we’ll get some more info on who’ll be in it and playing what. Also it is currently down for a 2011 release but that could be pushed back to 2012. Would Goode make a good Bilbo Baggins? Well it looks as if we Brits preferred the exploits of the bomb disposal team in Kathryn Bigelow’s The Hurt Locker over James Cameron’s Avatar. Bigelow’s film won best film and director, original screenplay, cinematography, as well as editing and sound awards. 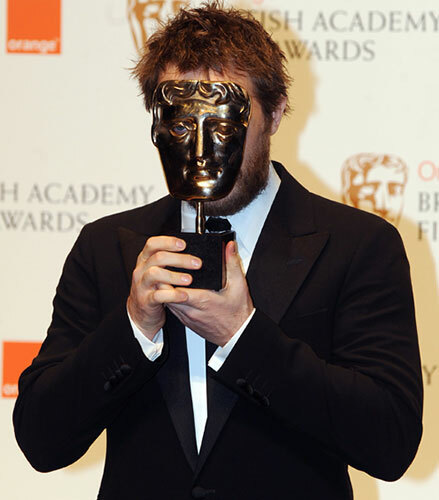 Well done to Duncan Jones who won Outstanding Debut (that’s him behind the BAFTA award below). Do you think the British Academy of Film and Television picked the right winners? Which way do you think the Oscars will go? 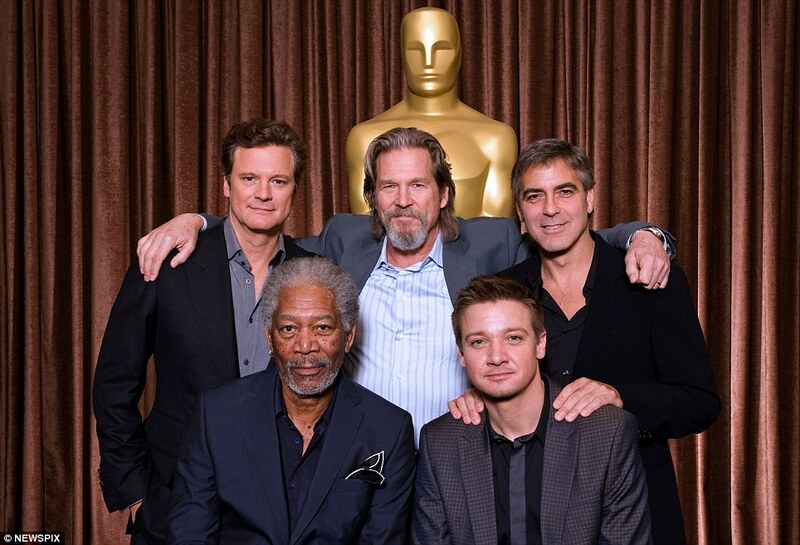 The 2010 Academy Award nominees attended the annual Oscar luncheon in Beverly Hills yesterday. Above is a photo of all 120 of them (click on it for a bigger version). How cool would it have been to be there? Jeff Bridges is looking cool on the left, 2nd row up next to Sandra Bullock. George Clooney is on the back row next to James Cameron, 5th and 6th from the left and Quentin Tarantino is a few spaces on from them. Carey Mulligan and Gabourey Sidibe are on the right in the front row with Jeremy Renner, Kathryn Bigelow, Morgan Freeman, Ivan Reitman and Jason Reitman just behind them. There are many more people you will recognize. I just think it is a great photo as is the one below showing all the best actor nominees. Check out the full list of nominees for the 2010 Oscars and whether Jeff Bridges will finally win an Oscar. This is fantastic stuff. Great to see all these actors together. Is acting art? Nicolas Cage, Colin Firth, Stanley Tucci, Morgan Freeman, Peter Sarsgaard and Christoph Waltz hash it out at our awards season roundtable. Stanley Tucci, Nicolas Cage and Morgan Freeman tell us how they handle disagreements on set. Will Colin Firth be nominated for an Oscar in this one? Will he win an Oscar? Who knows, but he has been getting rave reviews for it. George Falconer (Colin Firth) is a 52-year-old British college professor struggling to find meaning to his life after the death of his long time partner, Jim (Matthew Goode). George dwells on the past and cannot see his future as we follow him through a single day, where a series of events and encounters, ultimately leads him to decide if there is a meaning to life after Jim. It is the directorial debut of Tom Ford and stars Colin Firth, Juilanne Moore and Matthew Goode. It opens on 11 December 2009. 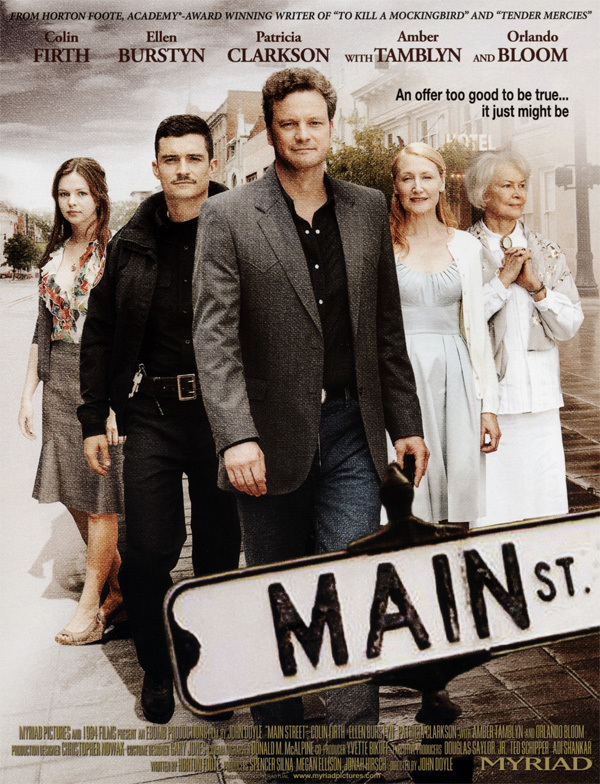 Main St – What is Colin Firth up to? Colin Firth is in the running for A Single Man (check out the trailer), but one of his next films is the final screenplay from Pulitzer Prize and Academy Award®-winner Horton Foote. It is a luminous and timely tale of a down-and-out small town that receives a mysterious visitor – a stranger with a promise to turn things around and bring the town back to its former pride and glory. I posted photos of Orlando Bloom on the set of this film a while back. 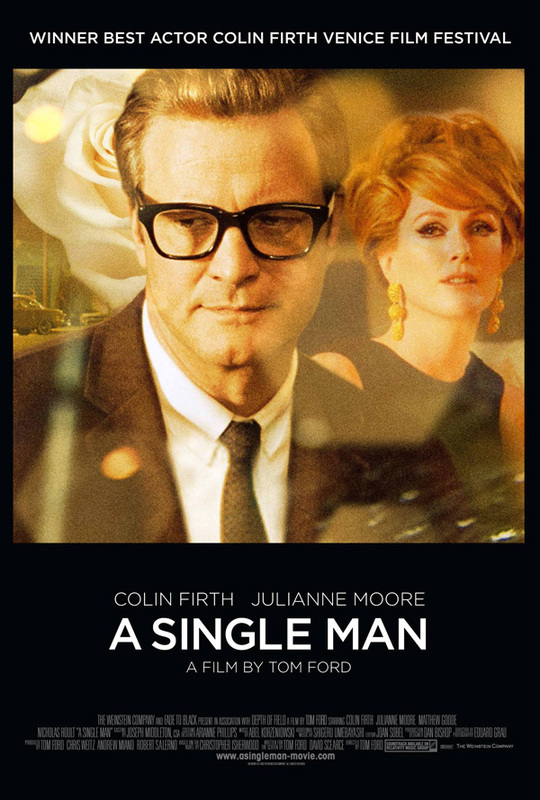 A Single Man is the story of George Falconer, a British college professor who is struggling to find meaning in his life after the death of his long-time partner, Jim . He is consoled by his closest friend Charley, a 48-year-old beauty, and is stalked by one of his students, Kenny. It is based on the novel of the same name by Christopher Isherwod and adapted by Tom Ford and David Scearce. Ford is the designer who spent ten years bringing Gucci back from the brink. The film stars Colin Firth (who won the Best Actor award at the Venice Film Festival for this role – more on that over at The First Post) as George, Julianne Moore is his friend Charlotte and Nicholas Hoult is Kenny, a student with whom George has an encounter. Matthew Goode (Watchmen) is also in it. It has been getting excellent reviews at the recent festivals that it has shown at. Definitely one to keep an eye on. Have a look at the trailer and let me know what you think of it. There where many entries into the Genova competition, but only 4 DVD’s of Colin Firth’s film where up for grabs. Congratulations to all of you. DVD’s heading your way soon. Ebenezer Scrooge begins the Christmas holiday with his usual miserly contempt, barking at his faithful clerk and his cheery nephew. But when the ghosts of Christmas Past, Present and Yet to Come take him on an eye-opening journey revealing truths Old Scrooge is reluctant to face, he must open his heart to undo years of ill will before it’s too late. Colin Firth loves a good costume drama. From Pride and Prejudice to the new take on Dorian Gray (check out the trailer for that here) the Firthster is there with the frilly shirt and the smouldering look. However, he has been known to star in films set in the modern day and Michael Winterbottom’s Genova is one of them. So any films set in the modern day apart from Genova and no sequels allowed! Email me the answer with the subject “GENOVA COMP” and include your name and address – Closing date is Sunday 13th September. The four winners will be chosen at random. My decision is final. A haunting, eerie journey to a place where souls stir and hearts go to mend themselves, Genova is the dark, brooding voyage of discovery for one family, torn apart by tragedy. With its sun drenched vistas and shadow-cloaked alleyways, and Italian town of Genova provides a fresh start for Joe and his two young daughters. Seeking new lives after the sudden death of their mother they’re all looking for something. As Joe throws himself into study and possible new relationships, the teenage Kelly loses herself in the underbelly of this mysterious new world.